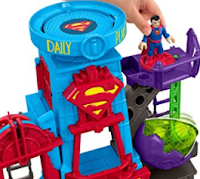 Right now, Amazon is offering up this Fisher-Price Imaginext DC Super Friends Super Hero Flight City for only $45.99! This is usually priced at $79.99, so grab this discount while you can! This qualifies for free shipping with a $49 purchase, or with Amazon Prime!